More than just a running camp, this two day/two night "running retreat" is an educational and inspirational experience designed to enhance your trail running whether you are a veteran or beginner. Explore the mind/body connection critical to successful training and racing. Enjoy breakout sessions in yoga, visualization, gear set up, and race day food preparation. Learn nutrition best practices for pre-race, during, and post-race. Experience day and night trail runs in the beautiful woods of Cockaponsett State Park right out the door of your lodge. Practice technical running as well as uphill and downhill running technique. Have fun with like-minded individuals and get inspired! You will emerge a smarter, reinvigorated runner equipped with the tools you need to make you smarter, faster, and more resilient, ready to unleash your highest running potential. WHO: The camp is open to all runners of all levels and abilities who want to improve, learn, and share. WHERE: The camp and retreat will be hosted at Camp Hazen in Chester CT, adjacent to Cedar Lake and Cockaponsett State Park. 5 meals, snacks and refreshments. Lodging in a rustic lodge with indoor showers. All group runs, and group training, led by Debbie Livingston and Coach Al Lyman and a few other inspiring friends TBD. And much more -- priceless! CAMP COST: $295.00 per person, includes occupancy in a bunk, all items listed above and more value and benefit to your training than can possibly be listed here! This camp/retreat is LIMITED TO ONLY 25 ATHLETES - first come, first served! Debbie Livingston is a passionate trail runner. She balances her athletics while managing a household with two young children. She is an expert on the subjects of running and pregnancy and running and children. She has finished more than 40 ultra-marathons and 100 trail races since her first off-road race in 1999. 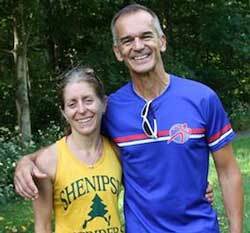 She was the New England Grand Tree Trail Running Series champion from 2001-2008. In 2011, she won five ultra-marathons, including the Grindstone 100, the Laurel Highlands Ultra (77 miles), and the Lookout Mt. 50 Mile Trail Race. She has run the Ultra Trail du Mont Blanc (UTMB), Javelina Jundred,Vermont 100, Tahoe Rim Trail 100, White River 50, North Face Endurance Challenge Bear Mt., NipMuck Trail Marathon, and many other classic races. She has a Master's degree in Fitness Management from the University of Connecticut and a BS in Health and Fitness from Springfield College. She is also an alumnus of the National Outdoor Leadership School (NOLS). She holds certifications from Kripalu Yoga and the Physical Mind Institute of Pilates. She has taught yoga for 15 years and Pilates for 7 years. Debbie is enthusiastic about environmental stewardship and has been on the Board of Advisors of the Appalachian Mountain Club since 2004. She is the long-time race director of the Soapstone Mt. Trail Race, and is past president of the Shenipsit Striders.